Such was the increased profile of SCCA Super Vee Championship, it started to attract some international participation with the arrrival of Dutchman Arie Luyendijk, who changed the spelling of his surname to Luyendyk to help the US press. In his Ralt RT5, run by Lee Hagen and financed by fellow Dutchman Aat Groenevelt's Provimi Veal business, Luyendyk won four races and took four second places, as well as four pole positions and four fastest laps. His closest competitor was Chip Robinson, one of the finds of 1983, who won three races in 1984 and had taken three second places up to the penultimate round, at Laguna Seca in October. Here he was leading comfortably on the last lap and poised to take the championship lead when a stub axle sheared and pitched his Cateret Savings Ralt into the barrier. That loss of 20 points would prove conclusive, and the Dutchman was crowned as champion. Both leading drivers moved up, Luyendyk straight into the Provimi Veal CART team alongside Derek Daly and Robinson into the Group 44 Jaguar IMSA team. Luyendyk would still be wearing Provimi badges when he won his two Indy 500s. 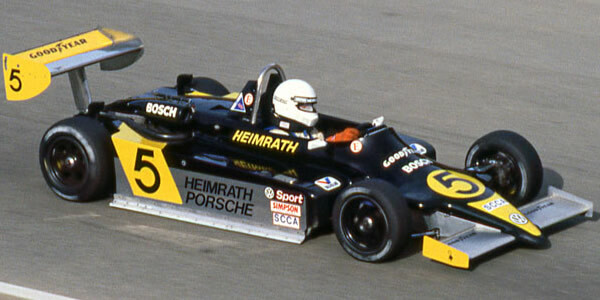 Ludwig Heimrath Jr who won three races but was not as good at getting his car to the finish, also moved into IMSA, driving an Alba GTP car for the Truesports team. Staying in FSV for 1985 but looking to follow in their footsteps were Californian off-road racer Jeff McPherson and Irishman Tommy Byrne, the fomer F3 star looking to rebuild his career after a brief but disasterous F1 career. Although Ralt dominated the season once again, at least there was some technical variety provided by concerns about the new pushrod suspension design that replaced the rocker arms on the new RT5/84. As in Formula 3, it did not prove universally popular and some 1983 Ralts with 1984 sidepods appeared during the season. As well as Ron Tauranac dominating on the chassis side, the 'Brabham' engine named after his old partner was the dominant powerplant. Built by John Judd's Engine Developments Ltd in England, the VW engines wore 'Brabham' on the cam cover since Jack Brabham had been Judd's original partner in the business. Other engine suppliers included Peter Schrick in Remscheid, Germany; Siegfried Spiess in Stuttgart, Germany; and Bertil Sollenskog in Antioch, IL. For more on this season, see John Zimmerman's seasonal survey in Autosport 24 January 1985 p59.